We hear often when traffic comes to a standstill – ‘bumper to bumper’ – which literally means vehicles are struck close together and are moving slowly. In automobiles, a bumper is usually a metal bar or beam, attached the vehicle's front-most and rear-most ends, designed to absorb impact in a collision. It is hard toughened material …. ,..try hitting at it with closed fist, you will feel the pain…. In some jurisdictions, bumpers are legally required on all vehicles. The height and placement of bumpers may be legally specified as well, to ensure that when vehicles of different heights are in an accident, the smaller vehicle will not slide under the larger vehicle. Bumpers are not capable of reducing injury to vehicle occupants in high-speed impacts, but are increasingly being designed to mitigate injury to pedestrians struck by cars, such as through the use of bumper covers made of flexible materials. There is another part often confused with bumper … it is ‘fender’ .. which is not a synonym but the part of an automobile, motorcycle or other vehicle body that frames a wheel well (the fender underside). Its primary purpose is to prevent sand, mud, rocks, liquids, and other road spray from being thrown into the air by the rotating tire. Fenders are typically rigid and can be damaged by contact with the road surface. Instead flexible mud flaps are used close to the ground where contact may be possible. Long back read a Tamil novel where the truck would be involved in a ‘hit and run’ case ….the sleuths would scan all repair shops in the city … finding out a vehicle left for repairs which will have severe impact damage on the bumper …. Wondered how would a man or animal getting hit – could cause any damage to that strong iron piece ……. it has to do with the velocity, the speed at which the crash occurs and not simply the weight of the bone that takes the hit !! 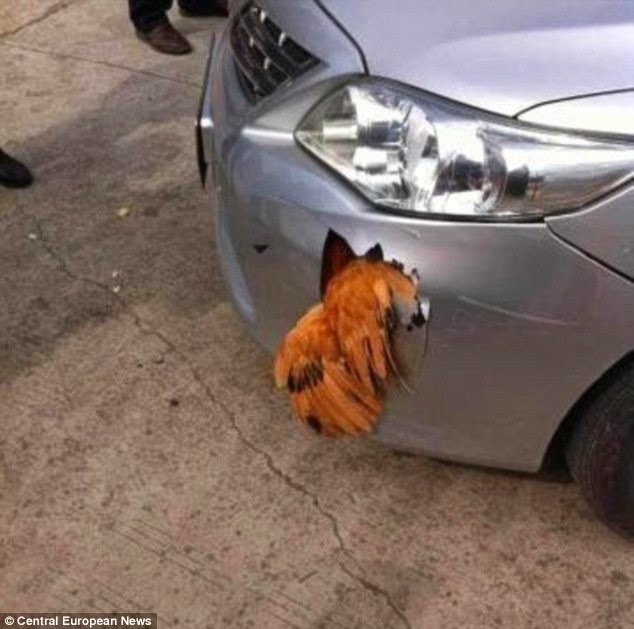 Chickens are considered fragile and not tough … though this one reported in Daily Mail turned out to be different… this bird was hit by a car at 70 mph, still survived, damaging the bumper. Daily Mail reports that a driver 'braked hard' when he saw the bird walk out – the Chinese car collided head-on with a chicken and came out worst in the encounter. The bird miraculously survived the encounter while the Japanese-made car was left with a large hole in the bumper. The accident happened near an industrial park in Xinfeng county in south China’s Jiangxi province. Huang Lingyong, 31, was at the wheel of his Toyota Corolla doing around 70 mph when the bird suddenly crossed the road in front of him. He reportedly was an animal lover and applied brakes hard. A sickening thud followed and the driver thought he had sent the bird to heaven. 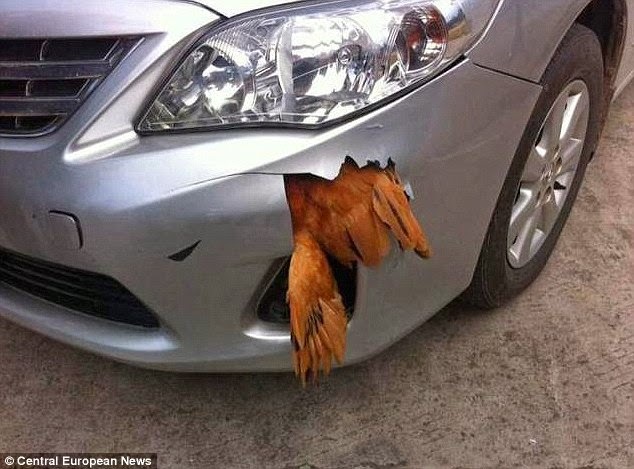 Later he stopped the car, got out, walked around to see a hole in the bodywork and the chicken wedged inside. The man thought it must be dead but found the chicken little shaken up and its feathers all ruffled, but otherwise OK. In his words, - 'It seemed to me to be a very good advert for the durability of chickens and a very bad one for the quality of the car that I was driving. He took a video with his phone and uploaded the pictures on the web, which received lot of response. Many Chinese people who saw his video took the opportunity to put the boot into the Japanese model. However, the car dealer who sold the car said that the bumper was a cheap Chinese copy, and not an original part. Concluding – some use ‘bumper to bumper insurance’ trying to mean that the policy would cover everything from one end to the other end. People should understand that even in ‘all risks’ policies there are exclusions ! !